Hook selection can be confusing because of the odd terminology and the lack of a common standard for sizes, shapes and lengths among manufacturers. Mustad has been a reliable supplier, consistently producing high quality hooks for more than one hundred years. Their computer-controlled tempering process produces a forged hook that is stronger and more reliable than many other hooks. 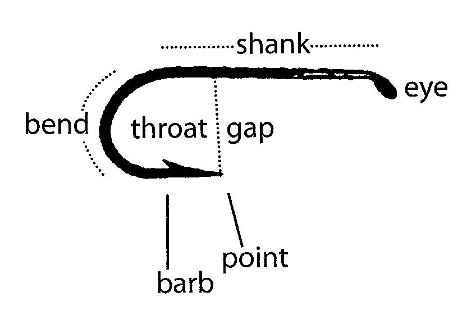 The hook gap determines the hook size, but secondary characteristics such as length, thickness and type of bend will also help one select the best hook for a given fly. Over time you’ll need to learn the reference system for the line of hooks you’ll be using. For example, a Mustad 94840 hook is a dry fly hook, a 3906 is a wet fly hook, a 37160 is a shrimp or scud hook and a 9409 is an up eye steelhead hook. Below are illustrations of the anatomy of a hook and actual hook size comparisons.